Forget stuffing and roasting whole turkeys on thanksgiving. Next November everyone's getting their own personal cornish hen! This was the most moist poultry I've ever made. Plus, aside from it being a little bit of a messy, hands-on eating experience, it's super elegant. 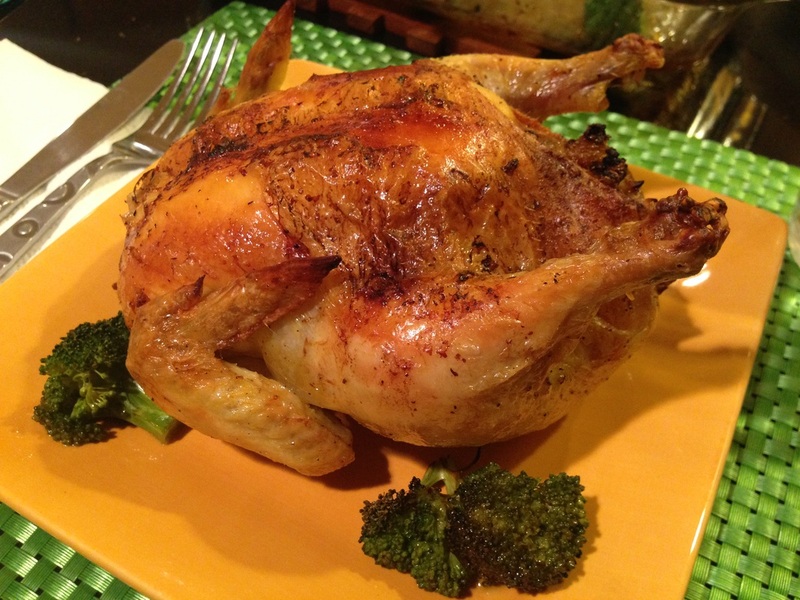 Cornish hens are a hybrid breed of bird. According to Wikipedia, two guys from Connecticut started cross breading chickens with other, smaller game birds in the 1950's. Their goal was to develop a single serving bird with lots of breast meat. The cornish hens I used for this meal were quite large compared to most. At two pounds, one stuffed bird easily provided two servings. This was no problem as they sliced in half surprisingly easily. The stuffing I concocted is mostly veggies with a hint of tart/sweet flavor from pomegranate seeds. Finely chopped mushrooms and just-mushy-enough winter squash sort of bonded the stuffing together negating the need for breadcrumbs. I truly believe that most people use breadcrumbs purely out of habit. They add virtually no flavor and the texture they add is that of soggy bread. Who wants that? Am I missing something? What is the appeal? Most patties, balls and stuffings hold together just fine without the addition of soggy bread. Anyway, this recipe is grain free. The cheese can simply be omitted to turn this into a paleo-friendly meal and if you're not a Costco member (or a primal dieter) and can't find dubliner, you can use an aged cheddar in its place. Roast butternut on a lightly greased baking sheet in a 425 degree oven for 15 minutes or until tender. Set aside. Saute mushrooms, celery, onion, salt, pepper, rosemary, cloves, and garlic in a small pan over medium/low heat until onions are translucent and garlic is fragrant. Remove from heat and mix in butternut, pomegranate and cheese. Remove any giblets from the hen. Stuff the cavity with the vegetable, pomegranate and cheese mixture, packing it in tightly. Rub the skin of the bird with a small amount of olive oil. Sprinkle with salt and pepper. Place hen in an oven safe dish. Pour 1/3 of the wine over the top of the hen. Bake in a 425 degree oven for 45 minutes, removing to baste with drippings and more of the wine twice during that time. The hen is cooked through when it has a center temperature of 165 and its juices run clear. Slice the bird in half with a sharp 8 inch knife to serve.